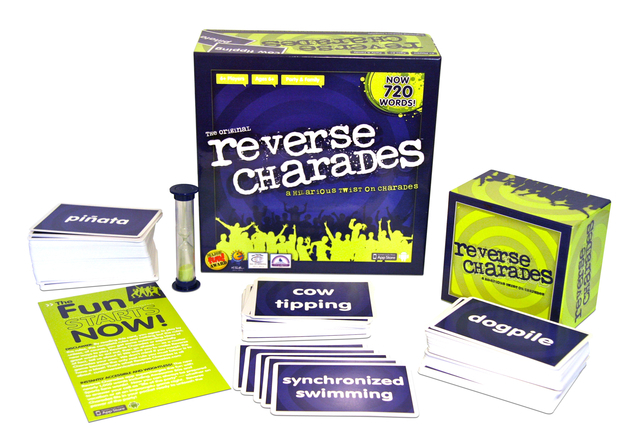 Featured on NBC’s Today Show and Radio Disney, the award-winning Reverse Charades is a hilarious twist on a classic stand-by party game where one person acts out words for the team to guess — boring! With Reverse Charades (the Original family or Junior editions), the entire team has 60 seconds to act out as many words as one person can guess. It’s a fast-paced, fiercely fun team competition that’s an absolute riot with families, work teams, school groups, party-goers or among a few close friends. New in 2012, Reverse Charades introduces three expansion word packs that will take the hilarity to a whole new level (and fit perfectly inside the Original or Junior editions): Girls’ Night In, Sports and Holiday editions. Reverse Charades has won a slew of awards: Oppenheim Toy Portfolio Platinum Seal award — Creative Child Magazine Game of the Year Award 2011 — Parent’s Choice Award — Mom’s Best Award — The National Parenting Center Seal of Approval — The Toy Man 2011-2012: Award of Excellence Award — KSL Studio 5 TV — Best New Family Game. Watch the fun: youtube.com/sedarahc. And follow us at: facebook.com/sedarahc and twitter.com/sedarahc. But be warned . . . you’re in for big and dangerous doses of fun!